The Asus ROG Crosshair VII Hero (Wi-Fi) – try saying that three times fast – is quite possibly the ultimate ATX motherboard for cooling and USB junkies – if you’re batting for team Ryzen+, that is. 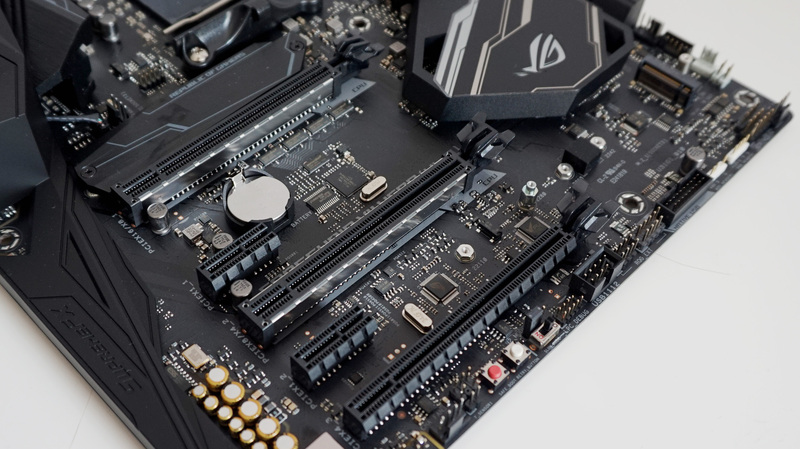 If you thought having eight USB ports on the Asus ROG Strix X470F-Gaming and MSI X470 Gaming M7 AC was generous, the Crosshair VII Hero adds four more to the pile, coming in for a positively monstrous total of 12. If all that wasn’t enough, you also get a whopping nine fan headers for the coolest of cooled systems. Nine fan headers I can just about get behind, but I can’t even begin to imagine the kind of situation where you’d need to have 12 USB ports. Still, while you can’t accuse Asus of being stingy when it comes to peripheral support, it does mean you’re giving up space for multiple display outputs (unless you count the single USB Type-C port), making it ill-suited to AMD’s other two new Ryzen chips, the Ryzen 3 2200G and Ryzen 5 2400G with integrated Vega graphics. As a companion for AMD’s Ryzen 7 2700 / 2700X or Ryzen 5 2600 / 2600X CPUs, on the other hand, the Crosshair makes a mighty fine match. Let’s see if it’s worth buying over the MSI X470 Gaming M7 AC. But first a word on why you might want to buy an X470 motherboard in the first place. After all, when all four of AMD’s new Ryzen+ chips are already compatible (after a BIOS update, of course) with every pre-existing AM4 socket motherboard that’s currently available – whether it’s got a X370 chipset or one of the cheaper, less fully-featured A320 and B350 chipsets – there’s actually very little need to upgrade to or buy a new X470 motherboard if you’ve already got one that works. Yep, that’s two USB 2.0 ports (one of which can also be used to update the BIOS without dealing with said BIOS screen or entering the OS), eight USB 3.1 Gen 1 ports, one USB 3.1 Gen 2 port and one USB 3.1 Gen 2 Type-C port. Well, going with an X470 board negates the need for a pesky BIOS update for starters, as every board comes with Ryzen+ support out of the box, but you also get AMD’s rather handy StoreMI acceleration tech for absolutely nadda. You’ll still have to download the software from AMD’s website and configure it accordingly, but this essentially gives all SSD / HDD combos a new lease of life by turning both drives into one giant SSD-like storage device, automatically moving your most-used files to the SSD, while keeping your least visited folders on the HDD. StoreMI adapts to how you access your files over time, too, so the things you need most at any given time should, in theory, take the least amount of time to be retrieved. Naturally, this doesn’t make for a very fair testing environment, so I conducted all my benchmarks without StoreMI enabled. Otherwise, you’re getting a very similar set of features to the previous tog dog chipset, the X370. In terms of PCIe expansion, the Crosshair VII Hero comes with two steel-reinforced PCIe x 16 3.0 slots that run at full-speed when used individually or x8 when used together (or even x8 / x4 when you’re also using the top M.2 slot), and a single PCIe x16 2.0 slot at the bottom that runs at x4. All three can be used for an AMD CrossfireX setup, too, but Nvidia graphics card owners will have to make do with just two-way SLI support. 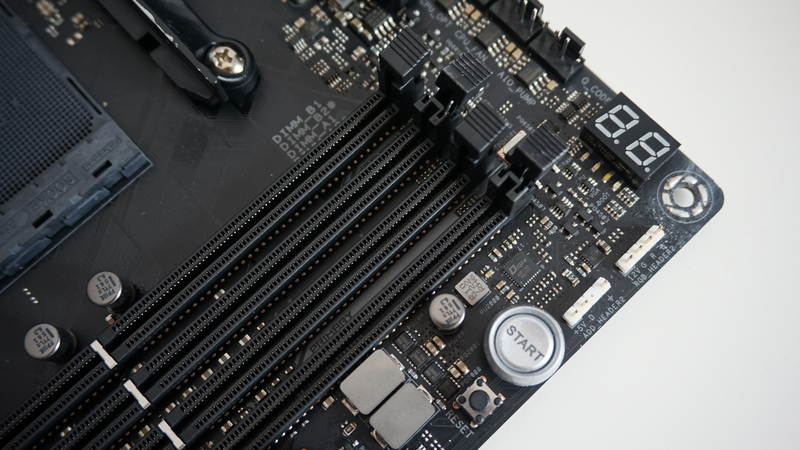 The Crosshair’s M.2 heatsink (above the top PCIe x16 slot) can be placed on either port. You also get four DIMM DDR4 slots that support up to 64GB of RAM and speeds of up to 3466MHz when overclocked. That’s the same as Asus’ X470F-Gaming, but just under the MSI M7 AC’s top speed of 3600MHz. Or at least that’s according to the Crosshair VII Hero’s manual, which is actually different to Asus’ own website that claims an equal 3600MHz. Either way, your RAM will go very, very fast regardless of which board you end up choosing. As alluded to above, the Crosshair VII Hero comes with two M.2 slots for super-fast NVMe SSDs in addition to the standard six SATA ports you’ll find on the far right. Again, much like the Asus X470F-Gaming, only one of the M.2 slots gets the benefit of an added heatsink to help it run as cool and efficiently as possible. Here, however, you can move the heatsink to sit on top of whichever slot you like thanks to a second pair of mounting screws on the other slot. This still isn’t quite as elegant as the MSI M7 AC’s double-pronged hinge solution that cools both of its M.2 ports simultaneously, but it does provide a little more flexibility than its cheaper Asus cousin. You also only get two PCIe 2.0 x1 slots rather than the usual three, but with so many USB ports and built-in 802.11ac Wi-Fi at your disposal, it’s unlike you’ll need to bolster the Crosshair VII Hero with lots of extra add-in cards anyway. Much more useful are those aforementioned nine fan headers, including one for a fan extension card (just in case you need more fans) and specific connectors for AIO water pumps and a high amperage fan. It should come as no surprise, then, to hear the Crosshair VII Hero comes with a load of extra overclocking features as well. While you don’t get a handy speed boost knob like the MSI M7 AC, you do get a numbered LED display for easy troubleshooting, support for Asus’ ROG Probelt meter for detecting voltage and OC settings, plus power-on, reset and safe boot buttons, as well as what Asus call a ReTry button to use during the booting process where the reset button fails to do anything. There’s also a slow-mode switch for extreme overclocking and liquid nitrogen (LN2) benching, which can be used to decrease the processor frequency and stabilise your system so you can better keep track of your overclocking data when your PC gets unstable. It’s unlikely most people will ever need to use this, but if you’re the sort that gets hot under the collar at the mention of nine fan headers, then this may very well be the thing for you. 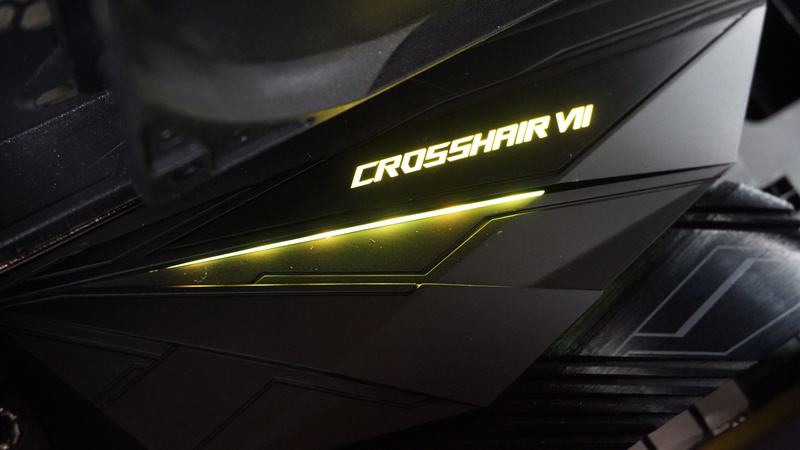 Rounding out the Crosshair VII Hero’s features are two Asus Aura RGB headers for syncing up your preferred light scheme across your all other Asus Aura branded products – including the Crosshair VII logo and cheeky RGB slash on the pre-mounted I/O shield as well as the ROG logo on the heatsink further down – plus another two addressable RGB headers for extra LED strips inside your case. So how does this super chilled motherboard work in practice, then? Well, when it’s loaded up with a Ryzen 7 2700X, 16GB of G.Skill Sniper X RAM running at 2133MHz, an Nvidia GeForce GTX 1070Ti graphics card and a Samsung 850 Evo SSD and running without a truck load of fans and water-coolers, it’s… only a little bit better than the Asus ROG X470F-Gaming. In the CPU-oriented Cinebench R15 benchmark, for example, the Crosshair returned a nigh-on identical score of 175 in the single core test, and a slower 1746 in the multicore test. The X470F-Gaming, by comparison, managed 174 and 1771 respectively, while the MSI X470 Gaming M7 AC came in with 173 and 1750. The Crosshair pulled ahead in Geekbench 4, which also tests CPU workload and real-world application performance, where it came out on top with respective single and multicore results of 4651 and 25547. However, the Crosshair resumed its middle-ground ranking in PCMark 10, scoring 4313 overall. It performed better than the X470F-Gaming in this instance, tackling its office and digital content creation tasks more efficiently, but the MSI was still the clear winner, steaming ahead with an overall score of 5665. The same thing happened in 3D Mark’s Fire Strike test, too, with the MSI out in front with an overall result of 16213, while the Crosshair came in second with 15976 – about 450 points ahead of the X470F-Gaming. In truth, the only thing separating the Crosshair from the M7 AC was a difference of just under 2fps in its combined graphics and physics score, so you’re not actually getting that much more out of your games performance-wise by opting for the MSI. The Crosshair also came in second in my SATA tests, producing respective read and write speeds of 38.5MB/s and 87.7MB/s in AS SSD’s 1GB random 4K test. In both cases, the MSI was about 6% faster than the Crosshair, but we’re talking differences of around 3MB/s and 6MB/s – which is hardly much in the grand scheme of things. This wouldn’t be so bad if the Crosshair VII Hero wasn’t so damn expensive – £252 in the UK, at time of writing, and $290 in the US. That’s a fair chunk more than either the Asus X470F-Gaming or MSI Gaming X470 M7 AC, but then again the Crosshair does a lot of things the others don’t – namely, giving you all those fan and USB connections. This, then, is a very specific type of AM4 motherboard for a very specific type of PC person – someone who isn’t so much interested in base performance as they are creating the ultimate liquid nitrogen-cooled mega rig. If you fit that description, then by all means go for it. For those looking for a more value-for-money approach, however, then the £215 / $230 MSI M7 AC is still my top pick for Ryzen+ builds. Tagged with AMD, AMD Ryzen, Asus, feature, Hardware, motherboards.